It’s almost St. Patrick’s Day. Time to throw on some green, grab your corn cob pipe, put on your dancing shoes and get ready for some great fun, music and maybe a libation or two. Just make sure you don’t forget all that great Irish food! After all, that is our favorite part of St. Patrick’s Day. There is so much great food inspired by beauty of the hills of Ireland. Whether it’s Corned Beef Soup, Potato Soup, Shepard’s Pie and Bean Stew, Irish cuisine simple, hearty and delicious. But, when it comes to Ireland classics, it doesn’t get much better than your traditional Irish Stew. Our food blogger Kate put together this classic Irish Stew that is so good you won’t help but do a little jig after each delicious bite. 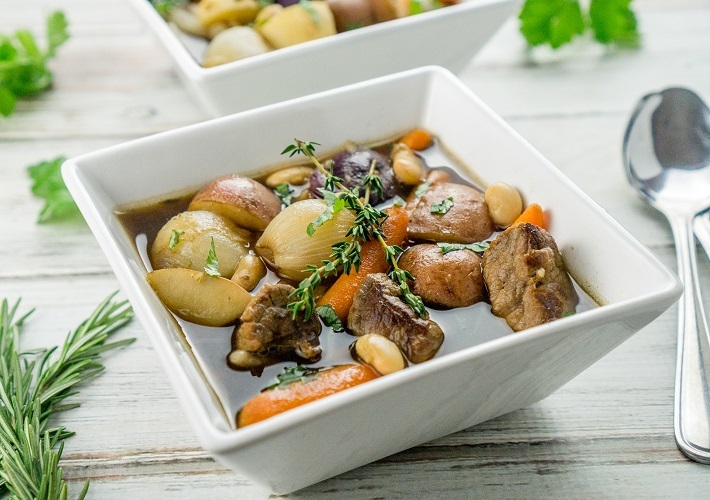 Our food blogger Kate put together this classic Irish Stew that is so good you won’t help but do a little jig after each delicious bite. What makes an Irish Stew great is the simplicity of its ingredients and instructions. Onions, carrots, beef, potatoes, broth and spices thrown in a pot is the no-frills approach to this classic. However, while respecting tradition, it is always fun to mix things up! That’s why in this recipe we added Randall Beans Great Northern Beans into the mix. Why? Because everything is better with beans, of course! They give every dish they are in that little extra flavor and texture. Great northern beans fit right in. This recipe also calls for some Irish stout (like Guinness) to add to the broth. This helps give the brew a little extra thickness and Irish flavoring. Any old potatoes will do, but for a little added festivity and color be sure to try tri-colored young potatoes in your stew. Whether you are hosting a party for family or friends or just looking for a good meal before you hit the town on St. Partick’s Day, be sure you get in the holiday spirit with a hearty bowl of Irish Stew. In a large stew pot, heat 2 tablespoons olive oil over high heat. Add the cubed beef and cook on high for about 3 minutes, or until browned. Season generously with salt and pepper. Turn the meat and brown on the other side for about 3 minutes. Add the next 9 ingredients (Irish stout through fresh thyme) and bring to a boil. Lower the heat, cover, and allow to simmer for 35-40 minutes, or until the stew has thickened, the vegetables are fully cooked, and the beef is tender. Remove from heat and garnish with fresh parsley leaves. Remove the cooked thyme and rosemary before serving.